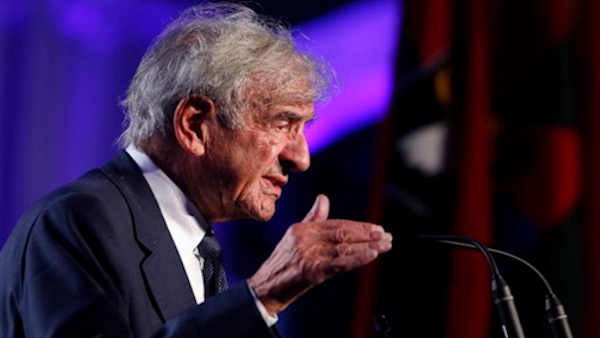 UPPER EAST SIDE, Manhattan -- Nobel laureate and Holocaust survivor Elie Wiesel was memorialized Sunday at a private service in Manhattan, as family and friends gathered at Fifth Avenue Synagogue. "He carried a message universally, he carried the Jewish pain, the message of Jewish tragedy to the world but he took it way beyond. He stood up for the people in Rwanda, he stood up for the Yugoslavians, he stood up for the Cambodians," Foxman, who has known Wiesel for decades, said before the service. Ronald Lauder, president of the World Jewish Congress, remembered visiting Auschwitz with Wiesel in the 1980s and was struck that Wiesel's response was not one of hate, but of "great sadness." "And he said to me what I think was one of the most important statements: 'The opposite of love is not hate, it's indifference, it was indifference that brought anti-Semitism to Germany and it was indifference that brought the Holocaust,'" Lauder explained. Millions learned directly about the Holocaust through Wiesel, who began publishing in the 1950s, a time when memories of the Nazis' atrocities were raw and repressed. He shared the harrowing story of his internment at Auschwitz as a teenager through his classic memoir "Night," one of the most widely read and discussed books of the 20th century. Foxman said that in recent months he and Wiesel would reminisce, in Yiddish, and talk philosophy. "This is really the double tragedy of it (Wiesel's death), not only the loss of someone who was so rare and unusual but the fact that those ranks are thinning out," Rabbi Perry Berkowitz, president of the American Jewish Heritage Organization and a former assistant to Wiesel, said Sunday. "At the same time anti-Semitism, Holocaust revisionism keeps rising. The fear is that when there are no more survivors left, will the world learn the lesson because those voices will be silenced." "Elie wrote 40 books, 50 books, the books will remain. That message will continue," Foxman noted. "There are 70K testimonies that the Shoah Foundation has put on record. ...It (Wiesel's death) will make somewhat of a difference because the authenticity of live witness is a lot different but I think the testimonies, the books, the oral history will continue to tell the story. "